1. The rate per kilowatt-hour that shows on your utility bill is meaningless because all charges need to be considered and paid. Determine your real electricity rate by dividing the bottom line, how much you owe, by the number of kilowatt hours you used. That is the blended rate and the only one that matters. The examples that follow use 10 cents per kilowatt-hour because it is an easy number to adjust to any rate. 2. If your electric bill is $100.00 then $20-$25 is due to lighting. That 20-25% for lighting is easily addressed to reduce direct and indirect lighting costs. One watt of electricity in a furniture store costs 40 cents per year assuming a rate of 10 cents and 4,000 operating hours. 3. Each watt of electricity used by a light bulb generates a watt of heat. Heat needs to be handled by the HVAC system so there is an indirect cost. It follows that If we reduce the heat generated, we can lower the load on the HVAC. A 40-watt fluorescent tube generates 40 watts of heat. A 40-watt light bulb in a table lamp generates 40 watts of heat. A 40-watt halogen generates 40 watts of heat. Watts is watts. 4. It costs twice the bulb cost to change a light bulb. Even when replacing the bulb in a table lamp, one has to consider the time it takes to recognize the problem, get the bulb, make the change, and dispose of the failed lamp. Getting the ladder to change a fluorescent in the ceiling, including moving and repositioning merchandise adds more time to the process. Fluorescents should be changed all at once, a technique called group relamping, to reduce labor cost by 30-50%. 5. Fluorescent light can (and should) be used in showrooms to provide ambient or background lighting. Fluorescents now have excellent color rendering and service life. Modern fluorescent light scores about 85 for color rendering on a scale of 0-100. The old tubes, cool white-warm white, score 60-65. We can see a big difference in color at 85 compared to 60. The difference between a fluorescent at 85 and a fluorescent at 95 is hardly noticeable. 6. Incandescent light scores 100 for color rendering on the 0-100 scale. It may seem strange but the crisp, white light of halogen gets 100, as does the dirty, yellow light of a 130-volt incandescent. The reason is that color rendering, the scale of 0-100, is determined by the color temperature of the light source. Halogen is about 3000 degrees Kelvin and the incandescent is at 2700 degrees. On the Kelvin scale, 3000 is cooler than 2500. This has nothing to do with heat. Warm light contains proportionately more red while cool light contains more blue. 7. The color temperature thing in #6 is really important. Just as with the different appearance of halogen and incandescent light, fluorescent bulbs can have the same color rendering (0-100) but colors will appear different. A fluorescent at 3000 degrees has more red than a fluorescent at 4100. Think of a blacksmith heating iron. As the iron gets hotter it goes from red to blue to white. The Kelvin scale is based on that concept. Incandescent light, including halogen, heats a filament, same as the blacksmith, so incandescent color temperature matches the Kelvin scale. Fluorescent light has no filament so color temperature is more difficult to determine. Fluorescent light is correlated to the Kelvin scale. When we say a fluorescent is 3000 degrees we are really saying, it falls into a range called 3000 degrees rather than giving an absolute value of 3000. 8. Years ago stores had only fluorescent light. Then we switched to incandescent reflector floods to improve the color of products. The next switch was to halogen because it was more efficient than incandescent. Stores were track only at this point. Efficiency was a consideration because electricity rates were increasing. Halogen bulbs cost more than incandescent reflectors but use less electricity and last longer. Fluorescent light with improved color rendering was added back into the lighting mix because track only stores are very dark compared to most shopping experiences. 9. Clearly there are differences in light sources. You can make shadows with halogen light because it is a point source. Light (and lots of it) is generated at the single point of a filament. Fluorescent light is generated along the entire surface of the bulb and is a diffuse source. You cannot make a shadow with fluorescent Light. For this reason fluorescent light should not be used in track lighting to accent merchandise. There will be no accent. The appearance of a fluorescent only store is like an old K-Mart. 10. 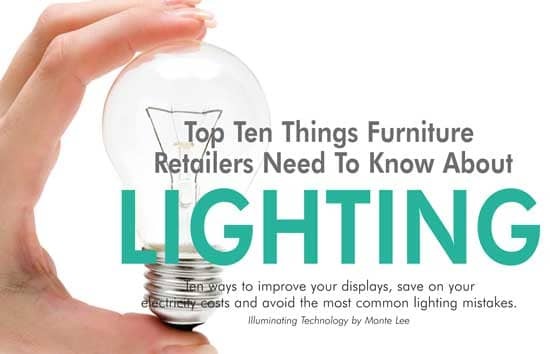 The best practice for a good looking store is to provide an adequate level of ambient light from a fairly uniform, fluorescent layout and accent lighting from track to provide visual interest to the sales floor. The amount of ambient light and accent light should depend on the price points and the type of merchandise. The rule of thumb is, The higher the merchandise price, the lower the ambient light level. Merchandise appearance is the key issue. 1. Replace every incandescent bulb on the sales floor with a compact fluorescent. The typical bulb in a table lamp is a 40-watt, standard incandescent. All it needs to do is illuminate the shade and a little of the tabletop. Replacing one lamp, 40 watt incandescent to 9-watt compact fluorescent, saves 31 watts, worth $12.40 per year. The payback on this investment is less than 3 months and your merchandise displays will look the same. If you like the brighter look of 60-watt bulbs in table lamps, then use a 13-watt compact fluorescent. Savings: 47 watts or $18.80 per lamp, per year. 2. Replace every downlight with a fluorescent. Downlights are typically recessed cans in the ceiling that provide general illumination to an area or hallway. They may have reflector or halogen bulbs. Don't replace those with the compact fluorescents that you used in table lamps ( twists or spirals). Downlights call for a reflector style compact fluorescent to direct light out of the fixture and withstand the heated environment inside the can. Savings are typically 62 watts or $24.80 per year, per can. 3. Audit your track lighting. Take a good look at (1) the placement of track heads, (2) bulbs being used and (3) whether the bulb is aimed properly. Heads should NOT be evenly placed on a track. Heads should be moved as necessary to illuminate each display. Some displays take more heads while some need fewer heads. You will probably find that 10% of your track heads are underemployed and can be removed. My rule of thumb is to use 4 or 5 track heads per room group. If you are using more than that, check the bulb. You may have 130-volt bulbs, which do last longer but have lower light output than the 120 volt bulbs. Often, retailers will ad more bulbs (read that as more cost is added) to compensate. The result is that a long lasting 130 volt bulb costs more money, heat and labor. 4.Replace incandescent reflectors or conventional halogen bulbs with Infrared Coated (IRC) bulbs. The incandescent reflector went out of favor because it is inefficient and produces a yellowish light. The incandescent reflector replacement was halogen. Halogen was an improvement, but IRC technology makes it even better. Inside every halogen bulb is a capsule about the size of the tip of your thumb. That capsule contains a filament and halogen gas. By coating the inside of the capsule with a material that reflects infrared heat back onto the filament, the filament becomes hotter and produces more light. By recycling waste heat, more light for less energy is produced. Service life is 4,200 hours on the Philips bulb we recommend so that means fewer changes compared to the standard, 2,500-hour lamp. More light, less labor, and a savings of $10-$12 per year per track head. 5. Audit your fluorescent lighting. If you find fixtures containing T12 fluorescents in your store it is time to upgrade your lighting. T12 fluorescents are 1.5 inches in diameter and will be stamped with F40T12 or F34T12 if they are four feet long or F96 if they are 8 footers. The time has come to replace T12 fixtures because they are inefficient and are no longer allowed in new construction. A typical 2x4, four-lamp, T12 fixture will use between 160 and 180 watts and can be replaced by a three lamp, T8 fixture using 82-87 watts. Your investment in a new fixture is paid back in less than three years.